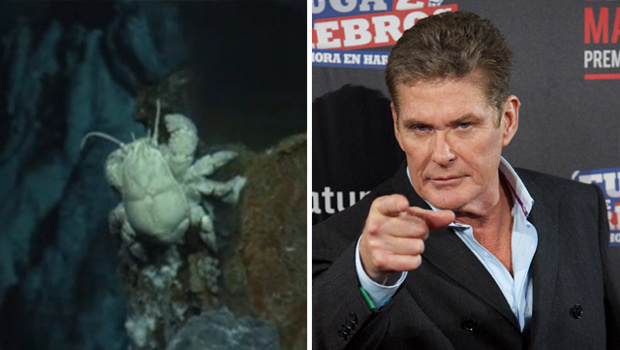 New crab with hairy chest dubbed "The Hoff"
(CBS) "The Hoff" is no longer just the nickname for actor David Hasselhoff -- now it is being used to identify a new species of crab scientist discovered that has a hairy Hasselhoff-like chest on the Southern Ocean floor near Antarctica. "Their nickname on the cruise ship was the 'Hasselhoff crab,' which gives you some idea of what they look like," said Professor Alex Rogers, who led the research cruise that found the new species, to the BBC. Since the creature has yet to be formally classified its nickname, "The Hoff," has stuck, but it will be given a formal name soon. While there is still no name for the species, scientists do know that it is a type of yeti crab, reports the BBC. Yeti crabs are known for their hairs along their claws, which they use to cultivate the bacteria that they in turn eat. "The Hoff" species were found in piles around hydrothermal vents on the seafloor with long hairs on their abdomen, instead of along their claws. The finding has been published in this week's edition of the journal PLoS Biology.